Are you sure you're ready for a night in the great outdoors? You've gone through your checklist, and everything is accounted for. You've practiced setting up your tent, and you've become familiar with using the rest of your camping gear. The cooler is packed with food and drinks, and your first-aid kit is stocked. Now you're ready to go. If only it were that simple. Many things can't be predicted when camping, but that's no reason not to prepare for uncertain circumstances. What they don't tell you about camping might surprise you, but it doesn't have to. The first time you go camping, be prepared. Why Does Camping Seem Like Work? Camping has its share of chores, but it also has its rewards. First, you have to find a level campsite. Then you have to unpack all your gear, clear a tent site, set up the tent, make your bed, start a fire, cook a meal, and clean up after yourself. Sounds like the same routine you might follow at home, so it can't be that much work. A few of the rewards include having a picnic, communing with nature, and sleeping under the stars. What Can I Do About the Bugs? First and foremost, keep a clean campsite. Bees are attracted to soda cans and ants are attracted to food scraps. Gather trash and dispose of it daily, don't eat in your tent, and don't leave food sitting out. Flying insects are attracted to fragrances. Don't wear makeup or cologne when camping, and use unscented deodorant. Bright lights attract mosquitoes, gnats, and no-see-ums. When you use a lantern, set it away from the sitting area. To help repel biting flies and mosquitoes, use an insect repellent. Citronella candles help, too. Why Is Everything Wet in the Morning? It didn't rain, but everything is soaked. That's because dew invaded the campsite. Warm weather with high humidity is the ideal condition for morning dew. As objects radiate heat during the night, they become cool enough to drop below the dew point and cause water to gather on the surfaces of objects close to the ground. Dew is a fact of nature and is unavoidable. Before retiring for the night, take clothes off the clothesline, put a tarp over things you don't want to get wet or put everything in the car for the night. Where Can I Get More Ice? Ask this question when you arrive at the campground. Summertime heat and frequent use of your cooler can cause ice to melt fast. Don't let all your ice melt without knowing where to get more. Some campgrounds sell ice, but sometimes the closest store is not so close. How Do I Dispose of Waste? It's amazing how much trash can build up at the campsite. Take along some plastic garbage bags. Don't burn trash in the campfire, and don't clean fish at the campsite. Dispose of trash daily in the campground's designated disposal area. The most important thing to remember when camping is to "leave no trace" of your visit. Learn how and live by that motto. A good night's sleep can be difficult when not sleeping in the comfort of your own bed. But just because you are camping doesn't mean you can't sleep better outdoors. Many new campers make the mistake of not getting a sleeping pad. Even in warm weather, the temperature difference between the ground and our bodies can get quite chilly. Sleeping pads are relatively cheap and add a layer of insulation between you and the ground. They also add some cushioning, which helps to make sleeping outdoors more comfortable. What Got Into the Cooler Last Night? Don't wake up to find your food missing or scattered all over the campsite. Letting animals get into your cooler is one of the biggest no-nos while camping. Depending on where you camp, there could be various critters living in the campground's vicinity. If there's the possibility that you have campground neighbors such as skunks, raccoons, squirrels, ravens, crows, or seagulls, to name a few, then you better be prepared. Such animals depend on campgrounds as their food source. Never leave food unprotected. Secure your coolers at night, and put dry foods in your car. Why Can't I Use Wood Around the Campsite to Build a Campfire? This downed timber is essential to replenish the nutrients in the ground for the other plants. If everyone who went camping stripped wood from the forest for their campfire, there would soon be no forest. Moral of the story: Bring firewood or buy some at the campground. What Does It Mean When a Campground Has Quiet Hours? Campgrounds usually designate quiet hours so that campers can enjoy a good night's sleep. Show respect for other campers by whispering during quiet hours. If you have an RV, don't run the generator. Try to arrive at the campground early enough to set up camp before it gets dark. Why Shouldn't You Choose a Campsite Next to the Bathroom? This is a common mistake that new campers make. Bathrooms are high-traffic areas and emit a lot of light. This is another reason why it's good to arrive at the campground early; otherwise, you may have no choice but to use the site next to the bathroom. 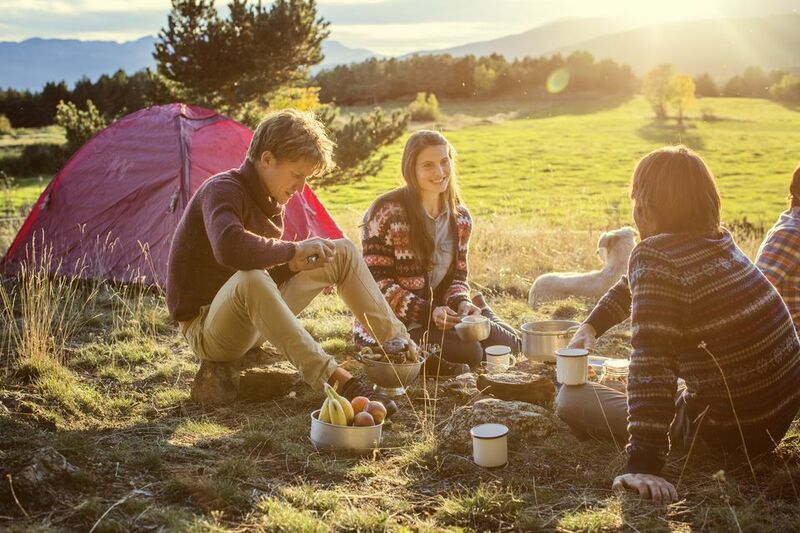 Despite all the discomfort and inconveniences that we may endure while camping, these outdoor experiences will be looked back upon as cherished memories.